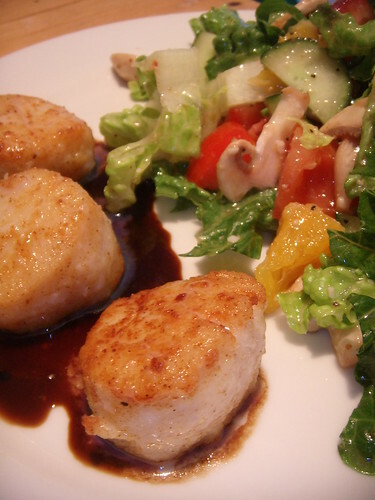 flaky crispy scallops over balsamic reduction with a light citrus salad, originally uploaded by aarn! +15th July, 2008+. pan seared some scallops which had been tossed in flour, tony chachere's creole seasoning, and cayenne, until crispy and brown, served over the balsamic and grand marnier reduction [3:1] (which has been kicking it in my fridge all syrupy-like and making everything so delicious). the salad was romaine hearts, cucumber, tomatoes, mushrooms, and slices of orange and strawberries. the dressing was a vinaigrette made from fresh squeezed orange juice, seasoned rice vinegar, fresh garlic, a splash of canola oil, and some shavings of romano cheese, blended until thick. nice blogging dude. the photos look great. thanks, trisha has been teaching me a lot about how to make this stuff look good. she has also taken a bunch of the pictures.